The so-called alien autopsy is an alleged 1947 black and white film (17-minute duration), released in 1995 by the London-based entrepreneur Ray Santilli supposedly depicting a medical examination or autopsy of an extraterrestrial being that was purportedly recovered from the 1947 crash of a “flying disc” near Roswell, New Mexico. The supposed 1947 film footage was allegedly supplied to Santilli by a retired military cameraman named Jack Barnett, who wished to remain anonymous. Then in an article titled ‘Roswell-Filme‘ published in his Stimme der Wassermannzeit Nr. 96, pgs. 1-23 in September 1995, Meier, citing the detailed observations made by the professionals (scientists, journalists and ufologists) exclusively invited to the first public viewing of Santilli’s alien autospy footage at the Museum of London on May 5, 1995 (pgs. 14-19), stated that the probability of the “alien” being a dummy was ‘extremely low‘ and proclaimed that – ‘One could quite clearly notice a poorly conceived and manipulated female human body‘ (pg. 17). One should note here that before Meier made the definitive claim regarding the “alien” being the corpse of a female human being, it was already suggested by (at least) one of the invitee’s to the aired footage in London museum (pgs. 16 & 18). How are we to judge the authenticity of the Roswell film, which allegedly depicts the autopsy of an extraterrestrial being? 33. We could not find any evidence whatsoever that a certain Jack Barnett or Jack Barret existed or actually filmed the footage as Ray Santilli initially identified the man. 34. We even took the time to travel back in time to the period of the crash in order to SCAN the actual location. Our findings were totally different from those shown in the movie. 35. Furthermore, there was no photographer or cameraman present who was filming and later allegedly absconded with several rolls of film. 36. Photographs were taken and filming was indeed going on but by members of the Army and the Secret Service, and they delivered all of the related material to the appropriate offices. 37. According to our investigations, the film is a despicable hoax that cannot be outdone in tastelessness, because the defrauders mercilessly and criminally abused a 16-year-old girl whom they used as their specimen after she died of an illness that had deformed her. 38. Unfortunately, I am not familiar with medical science, but Ptaah can give you more details when he visits you again. 39. One of his professions is that of a doctor. Then a few months later on May 13, 1996, during Meier’s 256th Contact, Meier asks Ptaah about the name of the disease the girl who was ‘slanderously presented as an extraterrestrial’ was suffering from. Ptaah responded with the name of the disease as Proteria. But what still interests me: Where was the corpse of the girl that has been abused for the film purpose? Do you know anything about this? 77. The proteria-diseased and deceased girl herself was not used for the reprehensible film and the alleged autopsy, but a macabre and malignant abuse took place in this way, that a replica of artificial materials was made of the girl, and the autopsy carried out on camera on this replica by the alleged physicians and pathologists. 78. The deceased girl herself was thus not abused as a specimen, but only the plastic product, which was deceitfully and fraudulently displayed as an extraterrestrial being. Thank you, that creates clarity. ..Then once again regarding the Proteria: Can you tell me something more? 90. And as I said, the 16-year-old proteria-girl was wickedly used as a model for a dummy product, as you call it. 91. A creation made of skin-like plastics, etc., which was equipped with similarly produced and animal organs as viscera and deliberately falsely portrayed as a Roswell extraterrestrial being, on which a phony autopsy was carried out and recorded on old residual films. This is quite contradictory to the information so far presented up to that time, where Meier/Plejaren unambiguously stated that the “alien” seen in the Ray Santilli’s footage was a 16-year old girl suffering from Proteria, a disease that apparently is non-existent in medical books and dictionaries. Then in 2007 (and again in 2017) the British magician and filmmaker Spyros Melaris also came out and made the revelation that he was man who led the team that faked the alien autopsy. 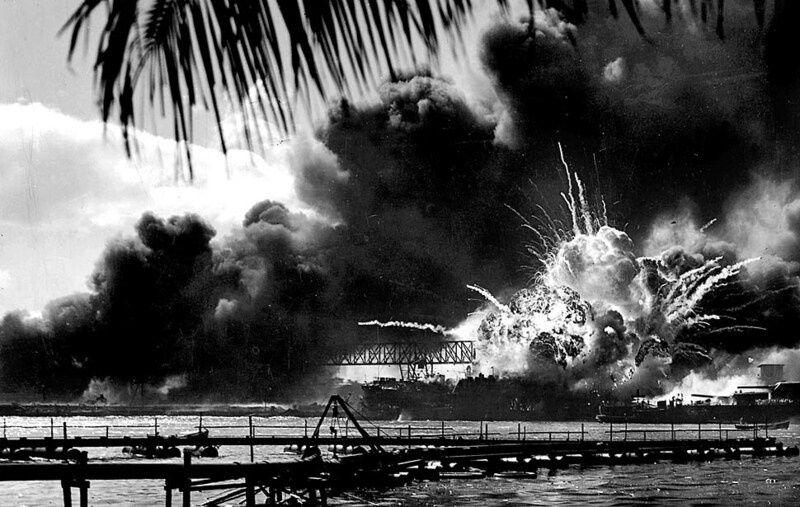 Pearl Harbor, Hawaii: The USS Shaw exploded after being struck during the attack on Pearl Harbor December 7, 1941. ..If I still remember correctly, you explained to me at that time, that, through their spies and through the CIA, the America government was fully comprehensively informed that the Japanese Air Force would attack the American fleet in Pearl Harbor in the early morning hours of December 7th 1941 and would certainly destroy it. This would happen practically without the Americans’ resistance because they were not at all interested in a defence. According to your explanation, those responsible, in the American government of that time, quite consciously sacrificed thousands of Marines and others belonging to the Army, as well as their flagship Arizona and many other ships, and with the intention, on one hand, to have a convincing basis for attack against Japan in order to be able to carry out official atom bomb tests on real objects, for which the cities of Hiroshima and Nagasaki were sought out, and secondly, to prove their war power and greatness, when they atomically destroyed two cities and annihilated hundreds of thousands of human lives with only two bombs, and made many cripples and programmed birth defects, on which their scientists could then drive forward relevant studies. Therefore, the then American government and the initiated scientists, military and other kinds of criminals, quite consciously sent their own people to death, let an entire fleet be destroyed and committed a war crime without compare with the destruction of Hiroshima and Nagasaki, and with the murdering of hundreds of thousands of humans, as well as their mutilation and evoked birth defects, without the truth being known until now in the public world, and without the Americans having been brought to justice for that, as it was also with many other cases of war crimes and crimes against humanity which the Americans have committed. Meier/Ptaah are basically floating the conspiracy theory that the US government was ‘fully comprehensively informed‘ about the impending Japanese attack on Pearl Habor on Dec. 7, 1941 but because of their nefarious agenda of testing the atomic bombs on real cities and also to prove their military might, had deliberately withheld the clear warnings about the attack and ‘quite consciously sacrificed‘ the lives of thousands of US soldiers and their naval fleet. Later in 544th Contact, that supposedly occurred on September 1, 2012, Meier mentions and blames the then President Franklin D. Roosevelt (FDR) for being part of the conspiracy who in-advance ‘learnt of the imminent attack through the secret services‘ but did nothing for the aforementioned reasons. In the same Contact Report, Meier further stated that these “facts” were only discovered 60 years later after the attack incident, by a former naval officer named Robert Stinnet in 2001 (see the book, Day of Deceit: The Truth About FDR and Pearl Harbor). 38. Attack on Pearl Harbor: The US government or the US military allegedly knew about the imminent attack on Pearl Harbor, but did nothing, in order to be able to lead a public cause of war. In addition to this flip-flop, Meier committed two blunders. First, in CR 238, Meier recalls information told to him by Ptaah in 1975 about FDR government’s foreknowledge about the Japanese attack on Pearl Harbor through their spies and CIA, at that time. But the Central Intelligence Agency (CIA) as it is being called today has got it’s name only in 1947 and before that it was called by many names over the years – as Office of the Coordinator of Information (COI) in 1941, as Office of Strategic Services (OSS) in 1942, as Strategic Services Unit (SSU) in 1945 and as Central Intelligence Group (CIG) in 1946. So in essence, Meier was absolutely wrong since CIA never existed back when Pearl Harbor attack happened in 1941, as the existing intelligence agency at that time was simply referred to as COI. But he misreads the record, misunderstands intelligence, mishandles facts, and misdirects readers. One expert on communications intelligence found twenty-three pages containing technical errors in the first third of Stinnett’s book before publication, but the author refused to correct any. Now, to the core question – why would Meier publish information on Pearl Harbor that contradicts his own earlier published information? Based on our research, the answer is very simple – Meier, having published thousands of pages of contact notes over decades, may have simply forgot the essence of the text he published on Pearl Harbor earlier (or altogether forgot he did at all) and instead came up with “new” information that, much to Meier’s dismay, happens to outright contradict his earlier material. This is not the first time that Meier, either inadvertently or not, caught flip-flopping or altering information in his contact notes. We have uncovered plenty of such examples during our investigation into his supposed prophecies and predictions (see pattern #4), and not to mention his “spiritual” homophobic teachings. Also, refer to “Epic of Gilgamesha”: Predicting the Future but Forgetting the Past.